 White, R.M. (1963) Generation of Elastic Waves by Transient Surface Heating. Journal of Applied Physics, 34, 3559-3567. Akaryan, A., Prolhorov, A.M., Chanturcy, G.F., et al. (1963) The Effects of a Laser Beam in a Liquid. Soviet Physics-JETP, 17, 1463-1465. Bunge, H.J. (1993) On-Line De-termination of Texture-Dependent Materials Properties. Journal of Nondestructive Evaluation, 12, 3-11. 张淑仪. 超声无损检测高新应用[J]. 国际学术动态, 1998(8): 58-60. 王再超, 李光辉, 冯海林, 等. 基于应力波和支持向量机的木材缺陷识别分类方法[J]. 南京林业大学学报(自然科学版), 2015, 39(3): 130-136. 岳小泉, 王立海, 王兴龙, 等. 空洞缺陷形状对杉木圆盘电阻与应力波断层成像效果的影响[J]. 南京林业大学学报(自然科学版), 2016, 40(5): 131-137. Savoie, J., Daniel, D. and Jonas, J.J. (1993) Ultrasonic Prediction of R-Value in Deep Drawing Steels. Journal of Nondestructive Evaluation, 12, 63-69. 张伟成. 无损检测新技术[J]. 油气田地面工程, 2008, 27(2): 78-77. Woch, S.C. and Zhou, Q.L. (2001) Behavior of Laser-Induced Ultrasonic Waves Radiated from a Wet Surface. Part I: Theory, Part II: Experimental Work. 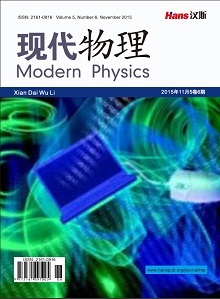 Journal of Applied Physics s, 89, 3469-3477. 孙宏祥. 黏弹性复合材料激光超声理论与技术[M]. 北京: 科学出版社, 2017: 36-38. 成俊卿. 木材学[M]. 北京: 中国林业科学出版社: 468-469. 尹向宝, 赵玉华. 激光超声无损检测技术[J]. 现代物理知识, 2003(15): 25-27. Lamb, H. (1996) On Waves in an Elastic Plate. Processing, 63, 109-115. Rayleigh, L. and Strutt, J.W. (1885) Onwaves Propagating along the Plane Surface of the Elastic Solid. Proceedings of the London Mathematical Society, 17, 4-11. Cheeke, J.D. (2012) Fundamentals and Applications of Ultrasonic Waves. CRC Press, Roca Raton. Achenbach, J.D. (2004) Simplifications for the Calculation of Surface Wave Pulses Generated by Laser-Irradiation. Journal of the Acoustical Society of America, 116, 1481-1187. Sohn, Y. and Krishnaswamy, S. (2002) Mass Spring Lattice Modeling of the Scanning Laser Source Technique. Ultrasonics, 39, 543-551. Guilford, W.H., Aust, L.E. and Bernd, K.K. (2006) Whole-Cell Flagellum-Based Motility Studied Using Back Focal Plane Interferometry in a Laser Trap Transducer. Fortieth Asilomar Conference on Signals, Systems and Computers, 1, 178-182. Edwards, R.S., Sophian, A., Dixon, S., et al. (2006) Dual EMAT and PEC Non-Contact Probe: Applications to Defect Testing. NDT & E International, 39, 45-52.